La Huerta de Valencia is one of the 6 market gardens that It still exists in Europe. During centuries, the mixture of water, the land and the wisdom of the farmers have formed a spectacular landscape that changes in each season. The institution that regulate the irrigation, the Tribunal de las Aguas, has been declared intangible heritage of Humanity. It is the oldest judicial institution in Europe. In the schedule tour on mondays it includes the entrance to the Huerta Museum and a guided tour within the most beatiful area of la huerta. 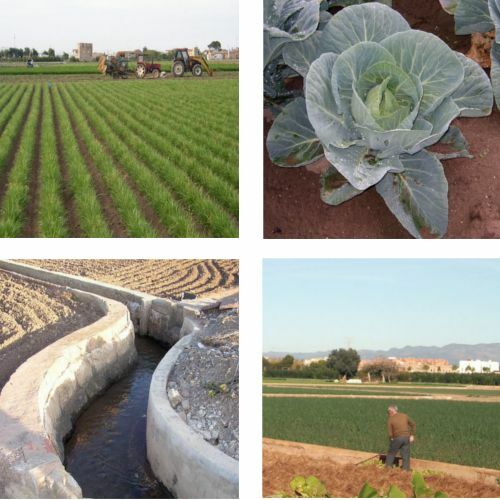 In any option, we will enjoy an agricultural area full of architectural richness; Barracas, farmhouses, alquerias… surrounded by crops; potatoes, onions, artichokes, tomatoes, chufa and many more. Furthermore a beautiful landscape that will make us forget that the city is just a one step. Meeting point: Almàssera Metro Station . C/ Mestre Serrano s/n . 39 º 30’44 .51 “N 0 º 21 ’14:17” W.
Duration: From 2 to 4 hours. 2km aprox. To see (by choice): Huerta Museum. Vegetables and tigernuts fields. Irrigation system. Farm houses. Carraixet ravine. Organic garden. To taste: You can include tasting of garden vegetables.